The showdown between the Eidsvoll 1814’s and the P.A. 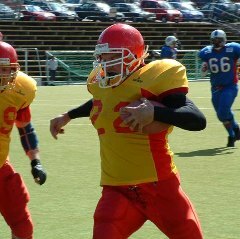 Knights of England was a highly anticipated game in group B of the EFAF Cup. This game weighed heavy on the 1814’s due to grasping a win it put them in position to have the number one seed for the playoffs. The game started off with Eidsvoll receiving the kick off. With the ball starting around the 30 yard line they put a solid drive together taking several minutes off the clock. The drive was capped off with a Joe Brannen pass to Dustin Creager from the 19 yard line. The ensuing extra point was missed making the score 6-0. The offenses by both teams were stalemated by amazing defensive plays for the rest of the first quarter. In the second quarter the Knights scored on a short pass to the tight end tying the score at 6-6. The ensuing extra point was good making the score 7-6 in favor of the Knights. The 1814’s returned the favor set up by a Joe Brannen 48 yard pass to Joe Black. A few plays later Brannen hit a leaping Creager for a 16 yard touchdown reception. The 1814’s, electing to go for 2 to make up for the previously missed extra point, was an attempt from Brannen to Creager which sailed out of the back of the endzone making the score now 12-7. Just after the subsequent kick off the Knights completed a short pass to a slanting receiver who was immediately hit by corner back Greg Kleidon creating a fumble. The fumble was picked up by Leif Snilsberg who rumbled down to the 1 yard line. Eidsvoll wasted no time putting the ball in the endzone when quarterback Joe Brannen took the ball sneaking in from 1 yard out. With the following extra point good the scoring halted at 19-7 going into half time. After halftime the two teams went back and forth exchanging punts. The Knights finally got a solid drive together eating up the rest of the third quarter and leading into the fourth. The drive came up dry on an interception by safety Heine Disserud putting the ball in the 1814’s offense. The 1814’s could get nothing going offensively and had to punt the ball away. With the Knights offense on the field they prepared to mount a drive to get back in the game. Marching down the field the Knights once again came up short with a fourth down pass that sailed out of the reach of the intended receiver from around the 1814’s 12 yard line. With 1:42 left on the clock the 1814’s needed to gain one last first down the seal the game. Quarterback Brannen took the first down into his own hands, after a pair of rushes by Obiajulu, gaining 18 for a first down and the win. With the win Eidsvoll sealed the number one seed for the playoffs and advances to the quarterfinals which will be held on May 20th at the Myhrer Stadium at 18:00.